Have you ever seen Gregory Peck’s remarkable portrayal of Atticus Finch in the film version of Harper Lee’s To Kill A Mockingbird? Mary Badham’s Scout is just as I’d imagined her to be when I read the novel. 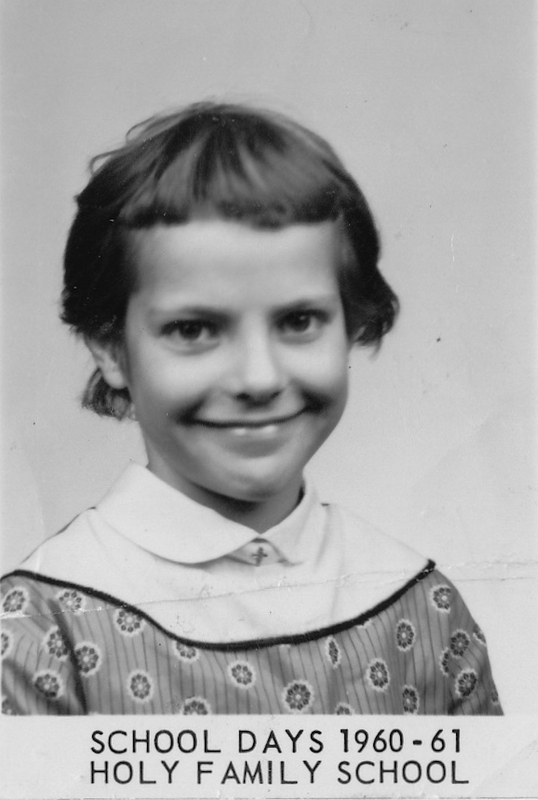 Take a look at her hairstyle, which mirrors mine when I was a kid — brown, straight, with bangs — frequently messy. The picture below shows me in 4th grade, the year of my first bad experiences in elementary school. Prior to this, I was blessed to be taught by three sweet women, Sister Mary Jerome, Sister Rita, and Mrs. Buechlein, who praised and encouraged everything I did; I blossomed as a student. On the first day of 4th grade, Sister Mary Jerome yelled at me. During her introductory speech / lecture, she asked if there were any questions. I raised my hand, stood up (the law at the time), and happily announced that Mother had given birth to my brother Andy the night before. She crossly told me that such a comment does not belong in the classroom and to save it for recess. I withered, and the tone was set for the entire year. I did not bloom again until I survived out of her class. I find it appropriate that my one physical memento of that year is this picture which reveals the horrific hairstyling techniques of my well-meaning mother.